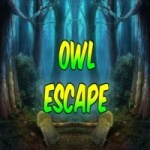 Owl Escape is a point and click escape game developed by 8BGames. Imagine that you went to a fantasy forest to photograph some rare species birds. While you were taking photographs, you a rare type of an owl locked inside a cage. Find some hidden object to solve some interesting clues to escape the owl from the cage. Good luck…Have fun!